Our ATX Hack for Change project was inspired by the continuing trend of Austinites being priced out of their neighborhoods. 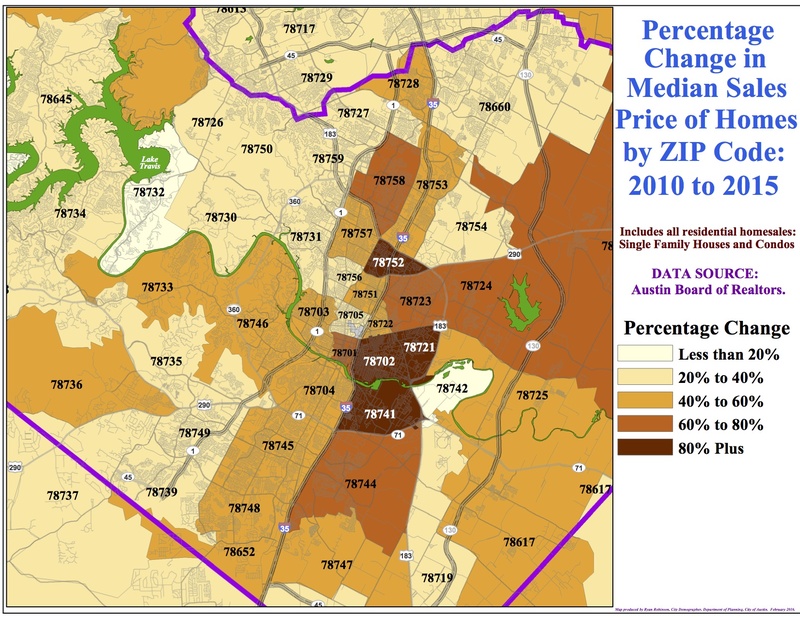 There are a lot of depressing statistics about this, but suffice to say: if you could afford to live in your neighborhood even five years ago, that is no guarantee that you can afford to stay there todayAs you can see in this graphic by city demographer Ryan Robinson, this problem is especially severe in East Austin. Property values in 78702 and 78721 have more than doubled in this decade alone. In 78721, there was a 118% increase in prices in that five year period. Of course, this is from two years ago. If you use today's median price in 78721, it's higher than that. We chose to make a mobile-first responsive web app because a quarter of low income and a third of very low income households rely on mobile-only internet. So far we've created a still-growing database of assistance programs, back end logic to match users with appropriate help, and we're working on WCAG compliance on the front end. BREAK FOR DEMO: Let’s say I’m 72 year old homeowner in 78702. Since retiring a few years ago, I live on a fixed income. In the meantime, property values in my neighborhood have doubled in the past seven years. My property taxes have skyrocketed past the limits of my budget. I decide to use Keep My Casa to see if there are services that could help in my situation. After providing my family size (2) and income ($27,000), I can easily select that I am a homeowner struggling to pay for property taxes. For the best fit for me, I can submit a couple of details about my unique situation (over 65),I get a personalized list of several local resources. Now I can easily call or review the websites to see more details about taking advantage of these programs. We've got a few boxes to check before we can launch this. We need to connect the front and back end, translate our content into Spanish, and create a user flow for people at risk of eviction.